It’s hard to believe that another AADOM Conference has come and gone. 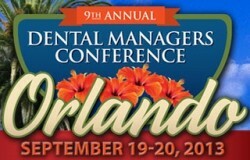 This year’s conference, the 9th Annual, was held in Orlando Florida, September 19th – 20th, and was the largest so far with over 600 attendees and 80+ exhibitors. There were many “firsts” at AADOM 2013. The most notable was the Keynote Speaker on opening day. This year’s motivational speaker came from outside the dental industry. Linda Larsen totally inspired the general session and set the tone for the rest of the conference. Another first was the announcement of next year’s location right at the start, allowing attendees to pre-register and take advantage of special discounts. The 2014 Conference will be in San Diego where AADOM will celebrate its 10th “birthday”. The FAADOM ceremony was held at the start of the second day this year, which accommodated attendees who might have to depart in the afternoon. There were many new speakers this year, and the list goes on and on! Having been to the last six conferences, I can say this was by far the best. The level of energy was off the charts! Attendees who I spoke with, and there were many, said they made more networking connections than ever. They were blown away by the level of education, saying they couldn’t believe how many ideas they received to help with challenges in their practice. First time attendees were, (as they always are), welcomed with open arms and taken into the fold with long time members and attendees. The most humbling part of the conference for me, was meeting and spending time with our Patterson Scholarship Winners! I never cease to be amazed by these individuals. This year’s “class” was incredible. They exemplified everything that makes a stellar office manager. But, more importantly, the devotion to their patients and to their teams was their first priority. I can’t say enough about these awesome people. This conference has become one of the best in the industry without a doubt. If you are an office manager, feeling like you are alone out on an island, I encourage you to 1) join this association and 2) attend this conference. You will quickly learn that you are not alone, there is an entire network of support waiting for you. And… If you’re a Patterson Advantage customer, we’ll cover your first year of membership! Just talk to your Patterson Rep for details. Congratulations to the entire team at AADOM for putting on the best conference ever. Looking forward to seeing everyone in San Diego in 2014! I have spoken at literally hundreds of events over the past 15 years and the AADOM conference was unequivocally one of my absolute favorites – for so many reasons. I LOVED the energy of the group! So very positive and happy! Everyone was tuned in, extremely responsive and ready to learn and have fun. Believe me, many associations do not have this kind of high commitment to 1) providing the BEST content possible for their members 2) creating the highest production values (what a GREAT stage and lighting!) that makes people immediately know they are in for something GREAT! and 3) making certain that everyone has FUN while they are learning! LOVE these people. LOVE them!!!! Thank you again, Patterson, for making it possible for me to be a part of the experience! Kim-great article about a great conference! AADOM more than met and exceeded my expectations. I am so grateful to all who made it possible for me to attend. Thank you, and if I don’t see you before-see you in San Diego 2014! Awesome Mary! It was great to meet you and I look forward to hearing from you this year! And, yep, hope to see you in San Diego 2014!! Yay Kim! I loved the re-cap. I am still riding the AADOM high at my office and expect to feel it for a while! I am one of those people that have was able to network more than ever before, mostly due to the gracious scholarship from Patterson. Yay class of 2013! Can’t wait for San Diego. Thanks Kim for being such a great mentor! Awesome Chiara! Have a great rest of the year, and put to use all those great things you learned! Don’t forget to reach out to your new friends for support when you need it!